Abattoir in the Aether – Out Now! Today is the day! 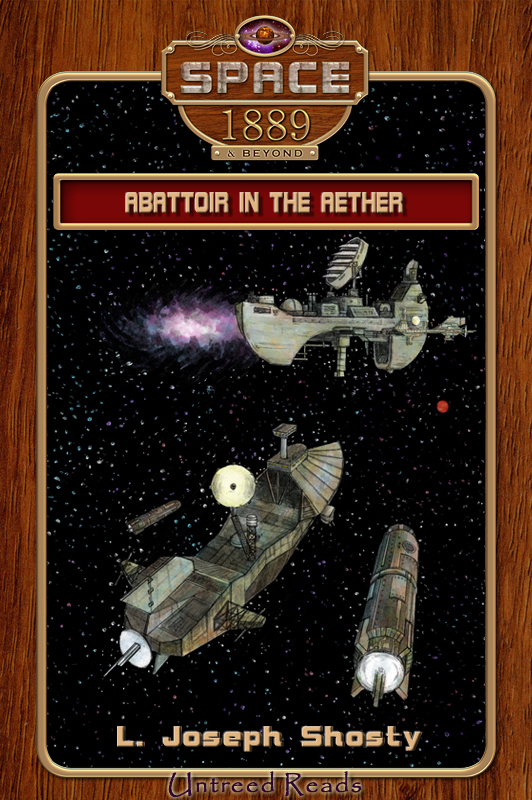 The brand new Space: 1889 & Beyond adventure is out; Abattoir in the Aether by L. Joseph Shosty. 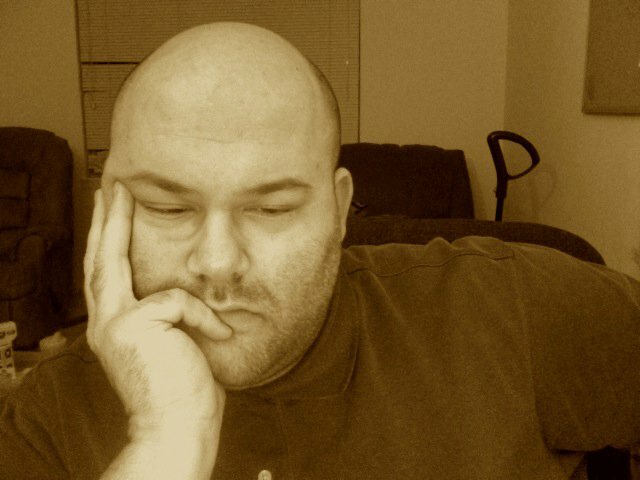 From Beaumont, Texas, where he lives with his wife and son, Shosty is the author of nearly fifty short stories, as well as numerous essays, articles, book reviews, and poems. 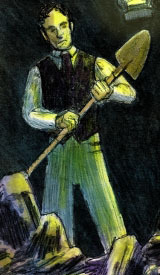 A novel, Sign of the Hanged Man, was serialised on the web in 2000 and 2001, and his story collection, Hoodwinks on a Crumbling Fence, was published in 2000. His second novel, a mainstream work titled The Return of Baldheaded Johnson, has recently been completed. AFA: What interested you in Space: 1889 & Beyond in the first place? LJS: It’s hard to explain without a little history first. I came to storytelling mostly through roleplaying games. I played my first game of Red Box D&D in second grade. By third grade I was running a campaign. That same year I became a voracious reader, and in doing so I discovered comic books. By early fourth grade I received TSR’s Marvel Super Heroes RPG, which had very basic rules, including a clear and detailed reasoning behind each power level. With this system I got a crash course in creating characters from the ground up, as it gave me hard numbers upon which to hang strengths and weaknesses, a mathematically quantifiable way of comparing them. Using a rough numerical concept of my own devising, I began creating my own superheroes and writing stories in my head as a way of falling asleep at night. By junior high, I knew I wanted to write for a living. 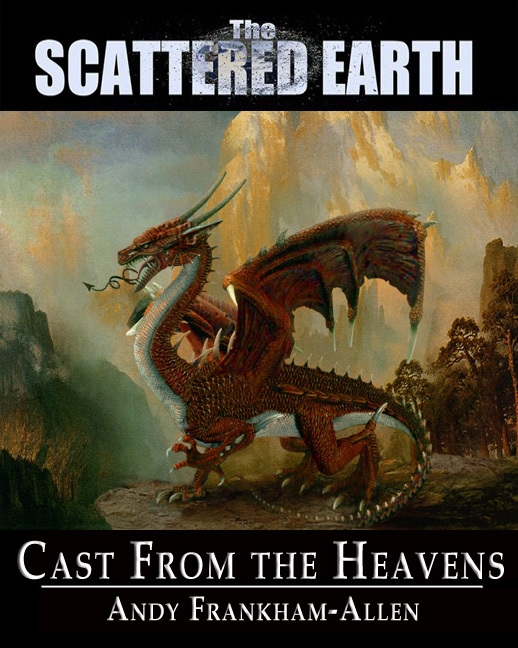 My earliest dream was to do a tie-in for TSR, especially their Forgotten Realms line. Jeff Grubb, Douglas Niles, and R.A. Salvatore were likes gods to me as a teen. I wanted to be like them and write a fantasy trilogy of my own. That dream ended when Wizards of the Coast bought the company, but I’ve always harbored a desire to do a tie-in for some franchise. When I was approached to do the Space: 1889 book, I jumped at it. I’d seen a copy of the RPG when I was a teenager. I hadn’t quite understood it at the time, but I’d thought the idea was intriguing. Years passed, and I independently cultivated a love of Victorian fiction, specifically the scientific romances. Seeing the gaming system again, I better understood what Frank Chadwick had done, and was thrilled. It’s a nod to the aforementioned romances, and, believe it or not, it finally gave me an answer to a question I’d been asking for about two years: what the hell is steampunk? I seriously didn’t know, nor did I know that I’d been reading its predecessor in Victorian fiction. Now, I’m in love with both the social and literary movements, and it certainly suits my sensibilities better than writing about Dragonborn the Oathsworn mowing down orcs by the busload. AFA: What difficulties did you face in converting a Role-playing Game scenario into a fully-fledged prose novella? LJS: None. Stocking a dungeon with monsters and NPCs is all about character, plot, and pacing. I wrote Abattoir in the Aether like I write adventure modules for one of my campaigns. The setting comes first, then come the maps, and then I stock each room with NPCs, combat scenarios, hidden rooms, treasure, etc. The only difference here was that I had to use pre-generated characters, if you will, in Nathanial and Annabelle. They were my PCs, and I had to run them through the adventure rather than have players do it for me. There was nothing at all difficult in adapting the scenario in prose form. The problem was in “playing” the two characters correctly. That was tough, but I’ll save that story for another day. AFA: Who are you favourite characters? LJS: Dr. Matthew Holmes is merely a sketch of my actual physician, Dr. Mike Holmes. I enjoy his company so much, it’s almost exciting to get sick so I have an opportunity to talk with him. A visit to his office is usually something like, “Well, chief, you have tuberculosis. We’ll want to keep an eye on that. So, did I ever tell you about the time I treated a geologist friend of mine, and he said…?” And the next thing I know, I’m hearing about The Burgess Shale Formation, and I’m actually interested in hearing about it. Wonderful guy, and I’m afraid I didn’t really have the space to do him justice. I also love Jasperse, the earnest ex-soldier who came to Peregrine Station to do the sweeping up, only to end up in a role as a security man. I modeled him partially in the rough-and-tumble mold of Danny and Peachy from The Man Who Would Be King and added something of my father-in-law in for good measure. Like Kipling’s characters, he’s an adventurer himself, only on a smaller scale. He’s been everywhere and done everything. Going out into the aether is the next logical step in his long life. No job is too small or too dirty for him, yet he has dignity and pride in what he does. He’s honest enough, and he speaks plainly, but he’s got a dangerous curiosity to him that leads him into some trouble. AFA: Your three favourite moments in Abattoir in the Aether are…? LJS: There’s an old saying among writers: murder your darlings. And it’s true that the best things you write often end up getting cut because they simply don’t fit. In this case, I had enough material to possibly fill a trilogy of books but only had time and space (and a contract) to write one. In the end it came down to deciding what parts of the story wanted to be told and what parts needed to be told. Of my favorite things cut from the novel, the first is Nathanial discovering a chess board and moving a piece. When he comes back later, he sees that someone has moved a piece on the opposing side. The game progresses through several chapters. Being that his personal guard, Jasperse, is an avid chess fan, he believes it’s him, but later, Nathaniel makes a rather chilling discovery: the phantom that is haunting Peregrine Station has been moving the pieces, which was such a clever parallel that I almost left it in. Basically anything about Nathaniel and his mates Dr. Holmes, Fullbright, Provost, and Jasperse that was cut makes the list, especially the tale Holmes spins of an imaginary grouse hunt where he makes each of them characters. It was such a sweet ode to friendship that I’d hoped to share with my close friends, but it never saw any eyes but mine. Many parts with Annabelle faced the axe, much to my despair, her visit to the greenhouses chief among them, which I removed when I ceased having Uriah Provost as a potential suitor. I hope this answer doesn’t confuse readers or make anyone believe that I don’t enjoy what I’ve written. Quite the contrary, but I felt an honest answer was in order. AFA: What’s coming next from you? LJS: Ha! Get comfy, and I’ll tell you. First up, I pitch a television pilot to a production company in January. Big excitement there, but I’m afraid I can’t provide too much on information on that just yet. I’m also trying to get my comic book company up and running. I’m partnering with several friends of mine to write scripts and brainstorm characters, design a website, and learn the ropes of digital comics. A superhero RPG is in the works to support it. As we speak I’m in edits on Ataraxia and Aponia, a mainstream (non-genre) novel I wrote earlier this year (2011) about a science fiction writer and Epicurean writing his first major work. If it finds an agent by the end of 2012, I’ll be happy. Speaking of novels, I’m also kicking around the possibility of working directly with fellow Space: 1889 author, K. G. McAbee, on a mystery novel. I love her and consider her my mentor, but we’ve never written anything together. That should be a heckuva journey, as our personalities and approaches to the craft are about as different as night and day. As for what’s on its way, I’m slated to appear in a number of magazines and anthologies, which you can track on my website, http://themadaccount.blogspot.com. Untreed Reads will also be publishing one of my short stories, “One of Us, Old Boy”. I’m especially excited about that, as I consider it to be one of the best stories I’ve ever written. Busy, busy, busy! The cutters were small ships, smaller even than Esmeralda, equipped for crews of five, though as many as ten or even twenty could be housed comfortably for short journeys. Such flyers were not long-range vessels, which left Nathanial wondering where they were headed. Unless he missed his guess, they were deep in the aether, with no planets for days or even weeks. A larger ship, perhaps, like Sovereign, could be patrolling the aether, yet, as he’d noted earlier, these men were not Royal Navy. And what was this foolish business about restricted space? A storeroom was cleared and turned into a makeshift prison cell, with two armed guards posted outside. Nathanial sat on the floor, scratching an itch on the back of his head. Annabelle paced the tiny bit of floor available to her. She was dressed much the same as she had been when Nathanial had last seen her, but he knew from experience that she had her derringer and knife secreted in places beneath her skirts that would be improper for a man to search. The gunshot he had heard earlier had come from one of the men sent to fetch her. She had leapt on his back suddenly, and the man had squeezed off a shot before the others, the big Irishman included, had wrestled her to the ground. Now she looked more like a caged animal. Gone was the generosity and industry he had witnessed in their journey from Mercury. Truly, the old Annabelle had returned, and, he had to confess, much of his old vigour was returning as well. The veil of doom was lifting from his shoulders just as the twin stones of anxiety and boredom were crashing down on her, as they often did when she had no external incidences to engage her. “Where do you think they’re taking us?” she asked for the eighth time. “We won’t know until we get there,” he said. Nathanial shrugged. Unless they had fallen into the hands of the Germans or the Russians, he was certain he could talk his way out of their predicament. His importance to the interplanetary efforts would be currency enough to buy his and Annabelle’s freedom, regardless of what phantom law they might have inadvertently broken. If they had broken any at all. Briefly, he wondered if perhaps groups independent of sovereign nations had gotten their hands on liftwood supplies or found a way to build an aether propeller, but he quickly discarded the line of thought. The notion of it made him want to laugh. Aether pirates! Sounded like some fanciful bit of dribble for the penny dreadfuls. His musings were interrupted by a sudden shaking of the hull. At first it was merely a vibration, but before he could think two thoughts in a row the vibration had become a rumble. Annabelle lost her footing, catching herself on the storeroom wall. Shouts from the crew rang out. Nathanial could hear them scrambling to keep the cutter on course. “What’s going on?” Annabelle shouted above the din. In his time on HMAS Sovereign he had experienced just such an anomaly, where the aether streams of Earth and Venus had met and reacted violently. The resultant “storm” could have destroyed Sovereign had it not been for his improvements to the design of the aether propeller governor. He recalled being afraid then, even though the chaps under Folkard had been particularly adept at navigating its outer edge. Still, the buffering the ship had received was nothing compared to what he was feeling now. Part of that had to do with the overall size of the ship. Sovereign had carried two cutters roughly the same size as this one in her belly, but that was only a portion of his concern. This vortex was definitely larger, and by turns more violent. The roaring became a screeching. Annabelle clapped hands over her ears and screamed, though the noise she made was drowned. Visions filled Nathanial’s head of the cutter ripping apart and their bodies floating free with the debris. He closed his eyes and drew his knees to his chest, where he sat with his head covered by his arms. His insides felt gelatinous, sloshing about inside his abdomen. Fresh from their adventures on Mercury, Nathanial Stone and his ward, Annabelle Somerset, are limping through the aether in a dilapidated flyer when they unwittingly stumble upon a heliograph station in solar orbit between Earth and Mars. Now in the sinister clutches of Dr Henry van den Bosch, a hulking nightmare of a man with a penchant for destroying those who cross him, Nathanial must race against time to prevent the station from falling into a massive aether vortex or risk van den Bosch’s wrath. But unseen forces hold sway on Peregrine Station, and before the two can even settle in, an attempt is made on Nathanial’s life. Annabelle investigates, and in doing so sets off a chain of events that could destroy the station before it ever reaches the vortex. Abattoir in the Aether © 2012 L. Joseph Shosty and Untreed Reads Publishing. It is with GREAT pleasure I write this entry. 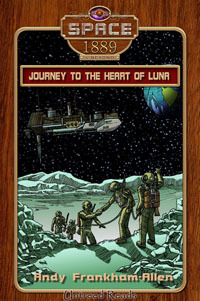 Space: 1889 & Beyond continues to be a hit for Untreed Reads Publishing. The best-sellers list for November is in, and I can reveal that at #1 is Mark Michalowski’s ‘The Ghosts of Mercury’. An impressive e-début for Mark! 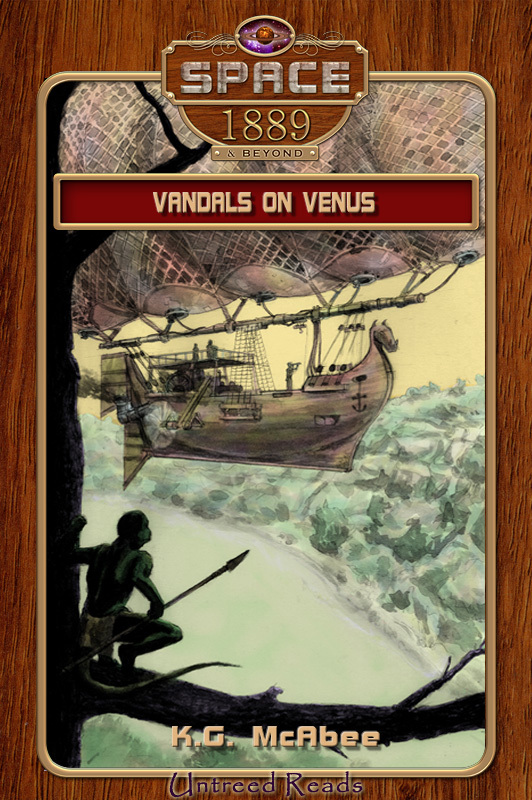 For the third month in a row my own ‘Journey to the Heart of Luna‘ remains in the top ten, rising to #4, while KG McAbee’s ‘Vandals on Venus‘ enjoys its second month in the top ten, currently at #6. A big thank you to all who’ve been following the adventures of Nathanial and Annabelle, but please, don’t let this mean you can rest on your laurels. Go and tell all your friends about this best-selling series, and help us dominate the steampunk genre! 🙂 And, as an incentive, all three titles can be purchased directly from the Untreed Reads Store with 15% off the RRP until December 15th! Well, well… the sales of ‘Seeker’ are still driving forward, with it doing quite well during its first two and a half weeks of publication. No word on the sales of the print version as yet, but I do know that the eBook is at number #7 on the fantasy chart at OmniLit.com. The book is now listed at almost every e-retailer, and is available to order in almost all high street booksellers. Now let me share with you this marvelous review from author Anne Brooke, in which she says; “In my younger days, I lapped up with great joy both the vampire novels of Anne Rice and the vast and fascinating fantasy novels of Stephen Donaldson and, to my mind, there’s been nothing to beat either of them since. I’m pleased to say now that I’ve been at last proved wrong in that assumption. Andy Frankham-Allen’s ‘Garden Saga’ fantasy series, of which Seeker is the first, takes the best of both those authors and combines it into a slow-burn, deep and surprisingly rich novel of one man, Willem (or Will) who, like Donaldson’s magnificent leper hero, Thomas Covenant, isn’t at all what he thinks he is. Frankly, I was gripped from the first page and couldn’t put the darn thing down.” To read the full review, why not pop over to Vulpes Libris?